Discover the rich history and magnificent landscape of Oahu on a full-day tour with an experienced guide. See historic sites such as Nuʻuanu Pali and Pearl Harbor’s USS Arizona Memorial, stop at the surfing beaches of the North Shore and scenic spots including Hanauma Bay, Halona Blowhole and more. Your experienced guide shares informative commentary throughout the day as you circle the island by coach. Especially if short on time, this comprehensive tour provides the perfect way to fully experience Oahu. Start your day with early morning pickup at your hotel then head directly to the USS Arizona Memorial at Pearl Harbor, located a short drive from downtown Honolulu. Your guide takes you on a tour of the USS Arizona Memorial, which starts with a 23-minute film about the history of the Pearl Harbor attack. Then take a short boat trip out to the memorial, a long building that spans the submerged battleship USS Arizona, which is visible below in the clear ocean. You'll have time to walk around the memorial and the Pearl Harbor Visitor Center, where you see artifacts from World War II and informative displays about the attack. After Pearl Harbor, begin your sightseeing tour of Oahu, traveling by comfortable air-conditioned mini-bus. Head toward the island’s North Shore as your guide shares local stories and history. Stop at the famous Dole Plantation to snack on a frozen pineapple treat, check out the gift shop or feed the fish in the plantation’s fish pond. Continue to the North Shore, renowned for its winter surf. Stop at spots with great photo ops and see famous surfing beaches such as Sunset, Pipeline and Waimea Bay. 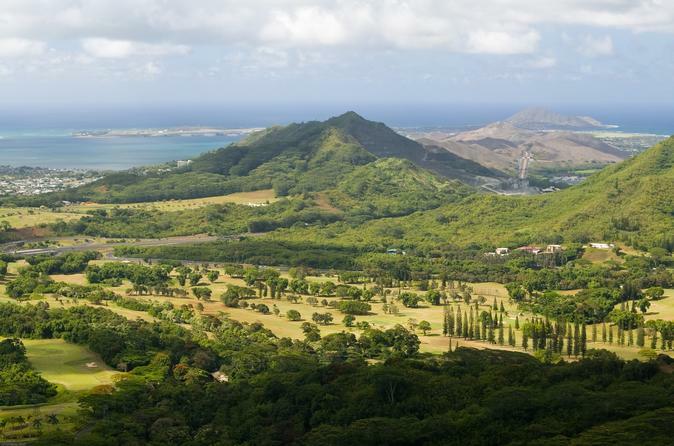 Then turn inland to reach the Nuʻuanu Pali lookout where you get panoramic views of Kaneohe Bay and Kailua Bay. Your guide explains the historic significance of this locale, where King Kamehameha I won a fierce battle in 1795 to bring Oahu under his rule. Descend from the mountains to the coast to head back towards Honolulu with photo stops at the lookout over Hanauma Bay and the geyser-like Halona Blowhole. Expect a break around midday at a place where you can purchase lunch. The fascinating 10-hour tour ends around 4:30pm when you get dropped off at your Waikiki hotel.